Morning Prayer seems most beneficial when it results in some searching beyond the provided texts and “learning” of some new things about Sacred Scripture, theology, or Church history. The quotes around that word in the previous sentence suggest that I don’t usually remember much from such searches and depend on some personally written summary I can refer to later. There is joy in organizing and summarizing information in a way that will be useful. So, here is one such simple summary. Today (3/8/2019), one of the Morning Prayer readings is Psalm 51. I was inspired (or inclined) to look it up in the Catholic Study Bible, 2nd Edition (NABRE) and found this commentary: “A lament, the most famous of the seven penitential Psalms…” The first word of Psalm 51 in Latin is Miserere (have mercy). All seven have traditionally been identified as Psalms of King David, famous for his adultery, murder, disobedience, and love of and by God. No wonder these Psalms are associated with and used during Lent! And according to this link, the seven were part of Jewish liturgy as early as the third century and have sometimes been associated with the Seven Deadly Sins. Here are the seven in prayer form from A Catholic Prayer Book. And below is some penitential music, Miserere Mei. I'm not very skilled at digging deeply into Sacred Scripture, finding new meaning and writing paragraphs about a verse or two. But I love looking at the Bible from a 50,000 foot view, so to speak, and detecting patterns, themes, characteristics, and differences. So, here are thoughts and observations about the Gospel According to St. John which St. Augustine apparently Tweeted was "shallow enough for a baby to wade and deep enough for an elephant to swim." 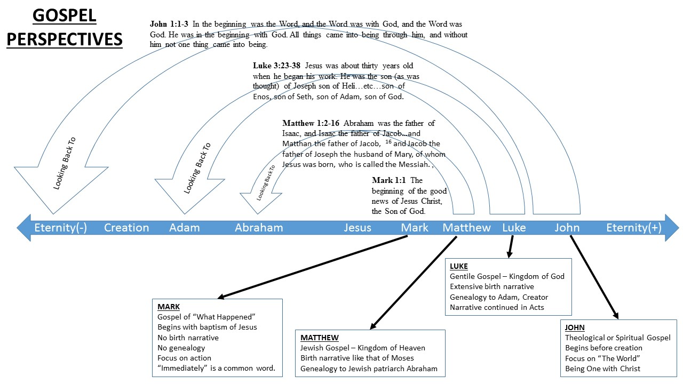 The chart below is an illustration of a simple difference among the Gospels, what they say about the ancestry of Jesus. Mark is the earliest and shortest and has a wonderful beginning: "The beginning of the gospel of Jesus Christ." So, if we had any doubt about what the Gospel of Jesus is, Mark makes it clear. Mark doesn't, however, say anything about the birth or ancestry of Jesus. He just gets right to what happened. Matthew, generally viewed as a Gospel targeted at a Jewish community, has a beautiful birth story with wise men and flight to Egypt and traces Jesus's ancestry back to the patriarch Abraham, who begat Isaac, who begat Jacob, who begat the heads of the 12 tribes of Israel. And Luke, generally viewed as targeted to a community of Gentiles, relates the Annunciation, the Visitation, the Nativity, the Benedictus, and traces the ancestry all the way back to Adam, father of all. 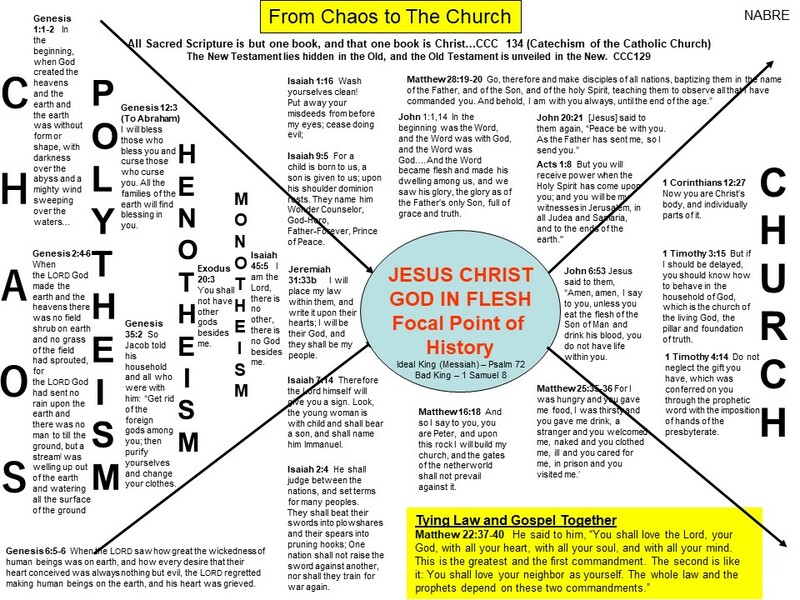 The writer of John had more time to think about the theology of Jesus and a Trinitarian God and copied the first words of Genesis, placing Jesus "In the beginning," with God, and the same as God, at the creation. Word counting is a great way to identify major themes in books of the Bible, and it is truly wonderful if one has software such as Bible Works which will do all the counting. 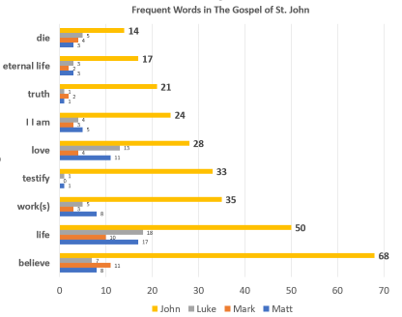 Here are some important words in John, in each case having as many or more appearances in that Gospel than in the other three combined. A good way to explore use of these words is to use an online searchable Bible to find the uses of the words and meditate on them. The "I I am" (which looks like 11 AM) deserves special consideration because the double emphasis, use of the pronoun "ego" which translates "I" even with the inflected verb (eimi) which translates alone as "I am" is understood by scholars and theologians as a reference to God identifying himself, at the burning bush, to Moses as "I AM." (Exodus 3:13-14) Every religious Jew hearing that phrase from Jesus as in, "I AM the way, the truth and the life," heard it as a claim to divinity. Believers bowed in awe and unbelievers charged blasphemy. It is worthy of note also that the word usually translated as testify or bear witness is the Greek word from which we get the English martyr. For the early Christians, bearing witness as Stephen did often resulted in martyrdom. A review of the use of "believe" can increase understanding of the fact that belief in john goes far beyond mental or intellectual belief to "believing in" or conversion or a change in direction of ones life. Here is an easy link to the list of 83 occurrences of "believe" in John. John was written around sixty years or so after the resurrection, probably to a well-grounded Christian community that knew well the stories of the birth, baptism, and transfiguration, and the parables and celebrated the Eucharist routinely. Therefore those stories were not told again, though we do have John's remembrance of the baptism, the Last Supper with Foot Washing, and John 6 explaining the significance of the Eucharist. 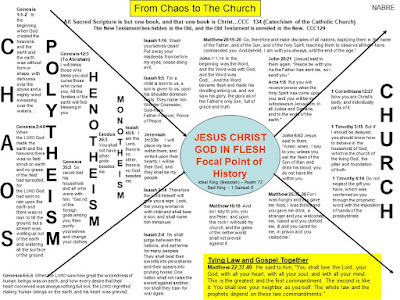 We have already mentioned in the first diagram that only John begins the Gospel of Jesus at the creation. It is worthy of note that John includes no parables or exorcisms but is organized around Seven Signs usually followed by long discourses by Jesus about key principles of the faith. One thing we can be especially thankful for is that all four Gospels begin the resurrection story early in the morning or at dawn on the first day of the week, Sunday. Below is an index of sorts of the content of John, chapter by chapter. The seven signs are in chapters 2, 4, 5, 6, 9, and 11. The three extended dialogues, Jesus with Nicodemus, Jesus with the Samaritan Woman at the well, and Jesus with the woman caught in adultery, in chapters 3, 4, and 5, are very interesting and simple while being theologically deep. Major events are in the third column. For a good story that could be expanded into a movie, read the Chapter 9 full "Crime Scene Investigation" aimed at identifying the culprit in the Sabbath healing of the man born blind. Jesus only appears at the beginning and at the end of the story. And, finally, the discourses which are all familiar to us from Gospel readings at Mass. Jesus and his followers spent a lot of time walking an area of around 900 square miles. In the Gospel of John, that includes three trips between Galilee and Jerusalem. No wonder Jesus instructed them, in Luke's Gospel, to not carry anything with them. And no wonder that the writer of John declared that Jesus did many other signs not recorded in the Gospel. The three trips "up to Jerusalem" are quite different from the single long journey in the other Gospels and are the basis for Church teaching that His ministry was three years. 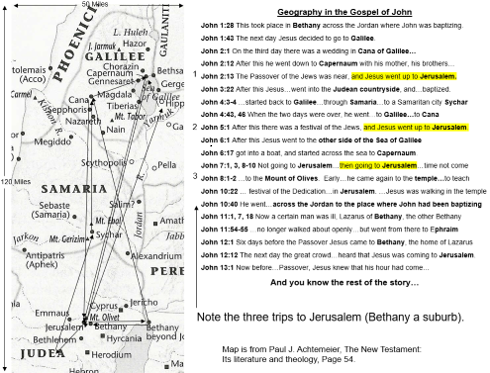 Note the two Bethany's, one across the Jordan where John baptized Jesus, and one a suburb of Jerusalem. Here are 24 key verses from the Gospel according to St. John including presence of Jesus at the creation, the incarnation, teachings about Mary, use of "believe," and importance of the "I AM." 1:14 And the Word became flesh and made his dwelling among us, and we saw his glory, the glory as of the Father's only Son, full of grace and truth. 1:29 The next day he saw Jesus coming toward him and said, "Behold, the Lamb of God, who takes away the sin of the world. 2:5 His mother said to the servers, "Do whatever he tells you." 2:11 Jesus did this as the beginning of his signs in Cana in Galilee and so revealed his glory, and his disciples began to believe in him. 2:19 Jesus answered and said to them, "Destroy this temple and in three days I will raise it up." 4:13-14 Jesus answered and said to her, "Everyone who drinks this water will be thirsty again; 14 but whoever drinks the water I shall give will never thirst; the water I shall give will become in him a spring of water welling up to eternal life." 5:24 Amen, amen, I say to you, whoever hears my word and believes in the one who sent me has eternal life and will not come to condemnation, but has passed from death to life. 6:35 Jesus said to them, "I am the bread of life; whoever comes to me will never hunger, and whoever believes in me will never thirst. 6:56 Whoever eats my flesh and drinks my blood remains in me and I in him. 8:12 Jesus spoke to them again, saying, "I am the light of the world. Whoever follows me will not walk in darkness, but will have the light of life." 12:44-45 Jesus cried out and said, "Whoever believes in me believes not only in me but also in the one who sent me, 45 and whoever sees me sees the one who sent me. 14:6 Jesus said to him, "I am the way and the truth and the life. No one comes to the Father except through me. 15:1 "I am the true vine, and my Father is the vine grower. 19:26-27 When Jesus saw his mother and the disciple there whom he loved, he said to his mother, "Woman, behold, your son." 27 Then he said to the disciple, "Behold, your mother." And from that hour the disciple took her into his home. 20:30-31 Now Jesus did many other signs in the presence of (his) disciples that are not written in this book. 31 But these are written that you may (come to) believe that Jesus is the Messiah, the Son of God, and that through this belief you may have life in his name. Read the Gospel According to St. John at one sitting. It won't take that long, unless you start reading all the footnotes and references. Hearing Sacred Scripture is a key element of Catholic worship. Usually, from the Old Testament, we hear a reading from the Law, Prophets, or Writings and sing a Psalm responsively. Then we hear a reading from one of the New Testament books other than the Gospels. Finally a selection from one of the Gospels is read by an ordained priest or deacon and heard with special reverence, followed by a homily. Often some important theme connecting the readings is reflected in the homily as well. 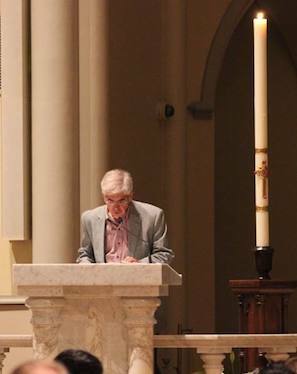 Though a lector at St. Peter’s Catholic Church for a few years now and, before that, at Ebenezer Lutheran Church, it was Dr. Monte Luker, professor of Hebrew and Old Testament at Lutheran Theological Southern Seminary, who first instructed me in lector best practices. I’m not going to try to blame any of my bad habits or errors on my friend and former teacher, but will try to explain what I took away from the directions he offered and why I read as I do. The objective of a lector in worship is to draw the attention of the worshipers to the words without any injection of personality or slant or opinion and without calling any attention to himself or herself. This principle links back to the first sentence of the blog which states the importance of “hearing” over that of reading. I believe this is the reason that, at Ebenezer Lutheran, lectors wore simple robes at the ambo. Even clothing and style should not distract from the hearing of The Word. So, I keep my eyes on the written page and do not try to make eye contact with listeners. Intermittent eye contact seems to me would imply that the words being spoken at the time of eye contact are especially important and are from me to the hearer. Even if I were to memorize the scripture to be read, I would still consider it important to keep my eyes glued to the printed page to assure accuracy and to avoid the impression that it is I doing the speaking or that I am emphasizing one point more than another. As a lector, I am only a mouthpiece. Let me hasten to say that these guidelines I try to follow do not apply in any way to the pastor or priest or teacher charged with exegetical responsibility. The best delivery for such persons is without script and with continuous eye contact and appropriate drama and emphasis to make the points deemed most important for the persons present, at the current time, after careful, prayerful, and inspired study of the written expression of the Word of God. That is a much heavier burden than just reading it. And, I must confess that my practices are contrary to the instructions in the Workbook for Lectors, Gospel Readers, and Proclaimers of the Word, United States Edition, produced by Liturgy Training Publications. But, I do the best I can and am always willing to step aside for someone who wants to serve. Yes, it is I at the ambo, reading, eyes down as promised. I do look up for the announcement, "A reading from the____ chapter of ______," and for the closing, "The Word of the Lord."